Pacific Shaving Company Blade Oil protects your razor from the damaging effects of exposure to ambient air. After the first use of any razor, your creams, gels and hairs remove the chemical coating that keeps the blade sharp and free from erosion. 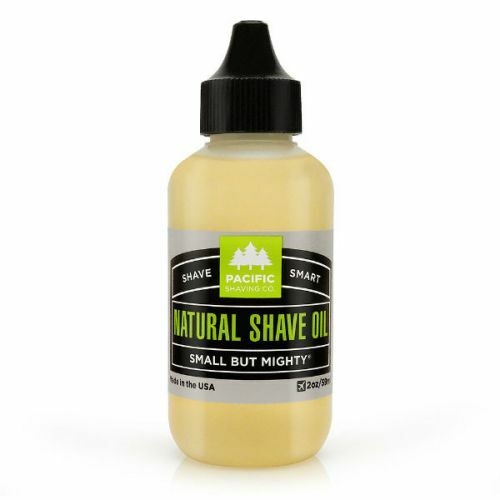 Applied to you razor after shaving, Pacific Shaving Company Blade Oil stops the blade from becoming damaged and essentially stops nicks and cuts during your shave. Helianthus Annuus (Hybrid Sunflower) Oil, Laureth-4, Cyclopentasiloxane, Persea Gratissima (Avocado) Oil, Aloe Barbadensis (Organic Aloe Vera) Leaf Juice, Aleurites Moluccana Seed (Kukui Nut) Oil, Tocopherol (Antioxidant), Limnanthes Alba (Meadowfoam) Seed Oil, Cucumis Sativus (Cucumber) Fruit Extract, Citrus Aurantium Bergamia (Bergamot) Fruit Oil, Essential Oils. Apply Pacific Shaving Company Blade Oil to your blade after cleaning. Use just a tiny bit to cover the blade.